Havant near Portsmouth 21 years ago - I'm watching my friends romp away with the team win at the National Junior Cross Country Championships (the late, great and very wonderful Sam Haughian was 2nd with Ben Whitby in 3th and backed up by Clayton Bannon). I was due to run in the senior race that afternoon but for another National I am unfortunately injured. I walked off that Havant course that day very disillusioned. Reading through my training diaries from back then (some shown below) the frustration injuries were causing is obvious. No sooner had I built up an excellent block of training I was then than stuck down with repeated calf or knee issues. I used to worry so much that I'd never fulfil my potential, whatever race I was lucky enough to win or do well in, was just never going to be enough. Young aspirations are sky high, my young self totally lacked contentment and any practical sense of realism. The National event was so iconic but for some reason or another I seemed to be forever missing actually running at one. Mostly through injury, sometimes through illness or because when I was competing the 'world trial' was always a separate event and that was the one I targeted. (7th place at the 1999 Senior National at Leeds is just about the only one I recall doing). I regretted not doing all of them, so when I started racing cyclocross in 2010 I vowed to always try and ride at the sport's prestigious event every time. Up to this season I had managed to do the last seven, with varying degrees of success, peaking in 2013 with a 3rd place. I was always happy to end the season with a ride at the big one, however this season proved the toughest one yet to make that start line. My knee was operated on in July last year. It was the identical operation I had ten years ago (on the same knee). On that occasion I recall I had got back to training fairly quickly. It transpires that a 47 year old knee is far less keen to 'crack on' again than it's 37 year old counterpart was. The months ticked by with no decent training under my belt. The cross season started and after one race it was clear I would be unable to race week in week out this time around. A full cyclocross season would usually consist of 25-30 races between September and January, but by the start of December I had only finished 5. The knee was not the only limiting factor. A persistent chest infection dragged on for weeks and then it seemed everyone and their dog around me had coughs and colds to avoid. This all meant I was just not doing the key hard sessions. Then there was the location for the 2018 championship......Durham! I'd raced in the Durham area alot in the 90s, there was always a televised international cross event there and on a few occasions the organisers paid for my flight up. Those days are long gone and a long drive and a weekend away from the family was required but as usual I was flush out of brownie points. Little form and a long stint on the motorway, should I bother? But I don't want to break my participation streak and remembering that feeling of regret from my running days, I committed to make the trip up North. A double race weekend in Yorkshire around New Year kicked me into gear and my first real hard session of the season on the Tuesday, just four days before Durham, knocked me into some half decent form. In previous years it had all been about how well I could perform at the most important race of the year but this time I was just happy to have made it to the start. Once back on the motorway I was soon at the venue in time to see an extremely busy band of workers constructing the course. A quick pasta lunch in the field, then it was time to do some practice laps. The course was a joy to ride, I spent an hour bedding the turns into memory. Although the van was full to bursting with kit, I did inevitably forget to pack a few essentials. Just two pairs of socks is, unsurprisingly, not enough to last 4 days away in the mud! But the biggest mistake I made was discovered just one hour before the start of my race on the Saturday. I been talking to a few people about the best warm up procedure and had planned a more intensive set of bursts on the turbo before the race. I set my road bike on the turbo (due to thru-axle the cross bike wouldn't fit on the turbo). It was then I realised my stupid error, I had forgotten to pack my road shoes, my cross shoes had different cleats on and were useless on the road bike pedals. My only quick option – to wear my hiking boots! It must have looked ridiculous.The course this year suited me well, unfortunately with little form over the season I had very few ranking points compared to previous seasons and for the first time in 5 years I was not gridded on the front row. I had to be content with a 5th row start. The race went well, I felt strong throughout and was happy with a 13th place finish, which was far from unlucky for me with the issues of the previous months. So that was the big one done for another year. The following day was a chance to wander around the course watching other races, relax and catch up with friends/rivals! Most of the year there is no time to talk other than to quickly say ‘hi, how’s it going?’ There has been countless people who have helped me (and Davina) over the years in the pits. Especially early on when we were pretty clueless. Wether it was supplying tools or helping with jet washing issues, the camaraderie epitomizes the fun that embodies cyclocross.The morning was spent watching the U23 and junior races, (witnessing Billy Harding ride the run up was inspiring (he was the only rider all weekend to do it)). In the afternoon I was stationed in the pits to help friends. Although the course didn't produce the need for many bike changes mid race, it was a good vantage point to watch the action. The women's field was small and the pits only had a few helpers in. So I was able to relax, drink tea and eat cake. Once the men's race started it was suddenly swamped and jockeying for a place was suddenly a much more aggressive pastime. I have come to enjoy the massive faff that jet washing entails. My current set up consists of a generator, jet washer, water bin, oh and bloody big trolley to kart it all around in, (running was such a cheaper sport). All that was then left to do was bundle everything back in the van and start the near 300mile journey home but with the consolation that the championships will be held down south next year. 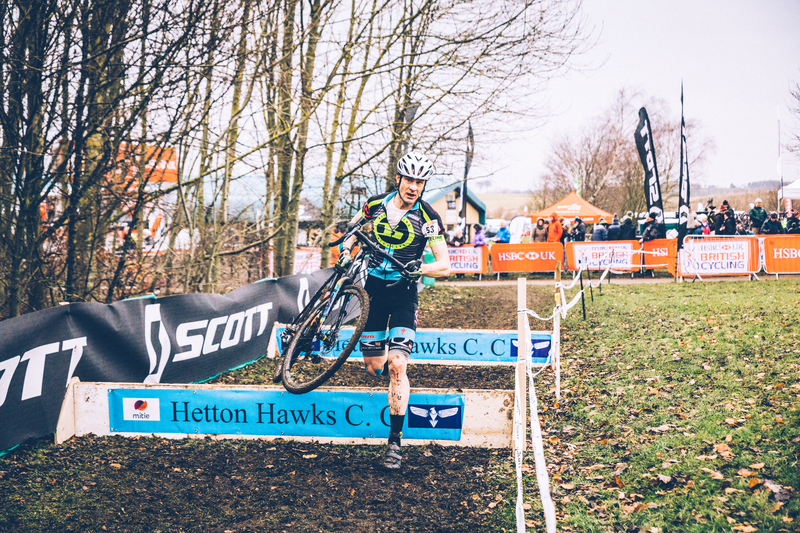 From the lows of missing running the National so many times, I am happy to have now ridden eight consecutive cyclocross Nationals with hopefully many more to come.